Dallas won't be able to address income inequality until it tackles transit inequality. This morning, Shima Hamidi, the Director of the Institute of Urban Studies at the University of Texas at Arlington’s College of Architecture, Planning and Public Affairs, briefed the Dallas City Council’s Quality of Life committee on transportation equality. If you have a few seconds, check out Hamidi’s whole Power Point. In includes a ton of fascinating maps and data sets (like the one above) that illustrate how issues like poverty, affordable housing, and public transit all fit together. For example, did you know that only 28.3 percent of affordable housing Dallas-Plano-Irving are actually affordable when the cost transportation is factored in? 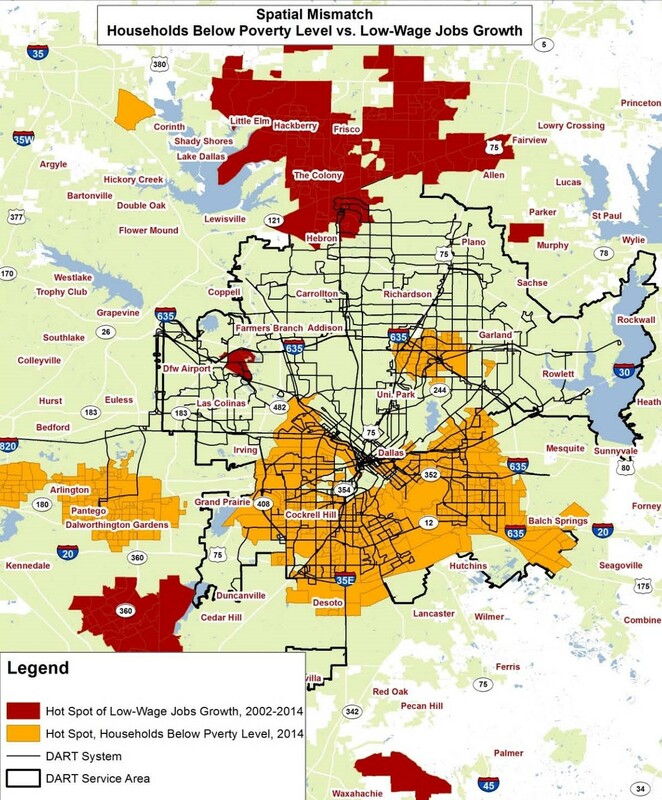 That statistic sets up the significance of the map below, which I believe tells the story of Dallas’ income inequality better than any map I’ve ever seen. The orange shaded area shows the highest concentrations of people living in poverty; the red shows the places with the highest growth of low wage jobs. In a healthy society, the people in poverty should have access to the low-wage jobs so that they could start earning an income and working their way outside of poverty. In Dallas, however, the geographic gap between new jobs and an impoverished workforce is huge and it continues to expand with the region’s sprawl northwards. I didn’t hear Hamidi’s presentation this morning, but the end of her Power Point suggests that her solution to this disparity is to rethink Dallas’ future growth both as it relates to transportation investments and incentivizing the development of denser, multi-modal urban communities. It’s a big task, but at least now we have the data that shows how solving Dallas’ lingering problems of transit and transportation are directly related to alleviating poverty.